Jordanians demand hope and change. Kind of a scary thought, eh ? “Reform and change, this is the demand of people”, angry protestors shouted among a mainly Islamists and leftist crowd joined by some tribal and liberal figures marching from the main Husseini mosque in the capital’s downtown to a nearby square. “We tell our government that reform has become a necessity that cannot wait,” Sheikh Hamza Mansour, the head of the Islamic Action Front (IAF), the country’s largest opposition group, told the crowds in a rally at the end of the march. “It’s not just the demand of the Islamist movement or the opposition party. 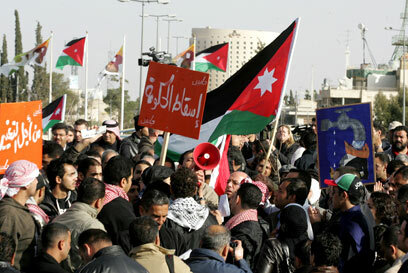 It’s the demand of all Jordanians,” he added. It all sounds almost exactly like campaign tactics used by the Ob…… Naaaaah, couldn’t be. Just a totally and completely isolated incident with no connection to anything anywhere. Wait…… Mansour ?…… No…… No way. That name is as common in the Muslim world as is Ayers, Soros and Sunstein is in America. Oh well, nothing to see here. This entry was posted on Friday, February 25th, 2011 at 12:33 and is filed under Main Postings. You can follow any responses to this entry through the RSS 2.0 feed. You can leave a response, or trackback from your own site.